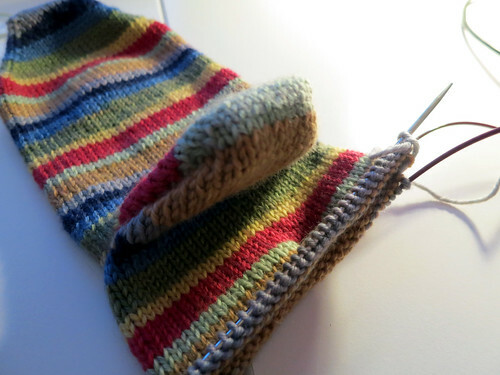 I've started yet another pair of self-striping socks. I can't help it. I love having the easy knitting for knit nights, kid birthday parties, sitting in the car, etc. This round of stripey socks is all about the rainbow. This yarn is from Knitting Fever. It's KFI Luxury Collection Indulgence Cashmere in color 609. I bought this yarn when I was teaching up at Needles 'n Pins in Wisconsin last month. I couldn't resist it. 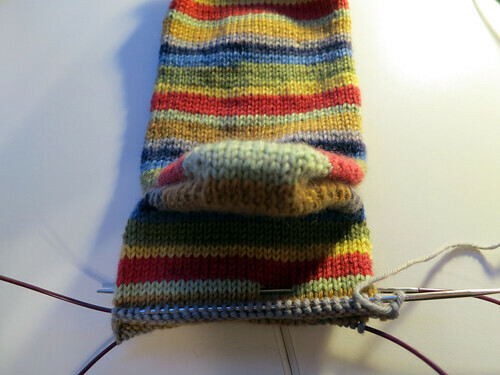 I am trying the Fish Lips Kiss heel for the first time on these socks. Sarah has mentioned on her podcast several times, and I've heard about it a few other places so I decided to give it a try. It totally looks like fish lips! 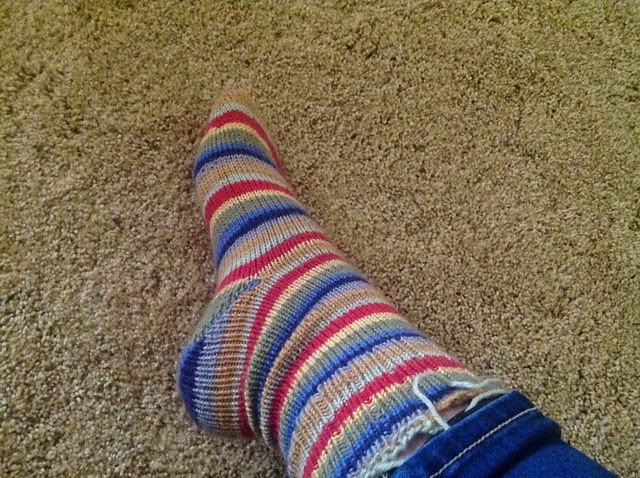 It fits so well and was so fun to knit, I think this will be my new go-to heel for my self-striping socks. There's no shortage of self-striping sock yarn around here, and I'm already thinking about what yarn I'm going to pick when these socks are done. The gradient stripes yarn I purchased from KnitCircus is definitely calling my name. I'm looking forward to those being my next socks with a FLK heel!